Amazon gets into the licensing business: its newly announced Merch Collab program promises to connect brands with designers and manufacturers, with Amazon tracking sales and paying royalties. 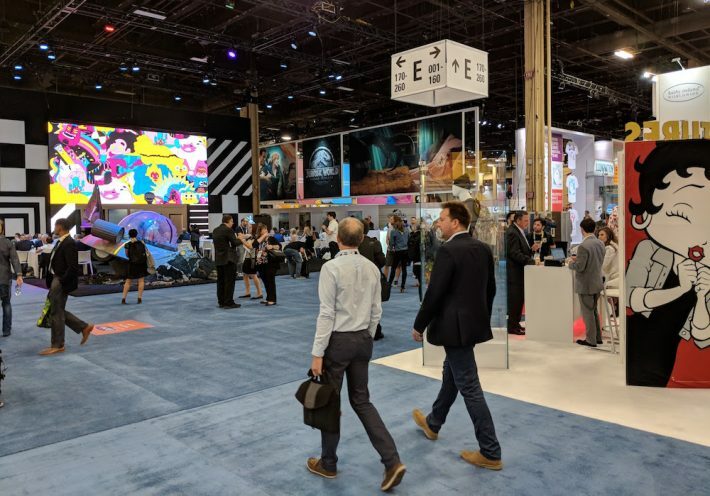 Today (May 22) in Las Vegas, Licensing Expo has kicked off its annual show with an announcement from Amazon on the launch of its Merch Collab platform, an online licensing and merchandising program that, in the company’s messaging, “makes licensing as easy as ‘Buy now with 1-click. Nicholas Denissen, a vice president at Amazon, unveiled the new program during the opening keynote at the show, which runs through Thursday (May 24). Read more about Denissen’s keynote speech remarks in License Global’s coverage of the event. Of interest to rights holders of all kinds—including book publishers and authors—the program promises to connect brands with pre-approved designers and manufacturers to produce and sell branded merchandise. Amazon tracks sales and pays royalties to both the brand and the designer. Denissen told the crowd that Merch Collab is now accepting applications from brands, designers, and manufacturers. As of this writing, brands listed as part of the program include Neil deGrasse Tyson, Shane Dawson, Annoying Orange, Rick and Morty, and Impractical Jokers. Based on the legal terms published on the Merch Collab site, here’s how the program works: Brands upload their content and guidelines to the platform. Designers are then given access to this content and can submit designs based on brand content to Amazon. Once approved both by Amazon and the brand, approved manufacturers use the design to produce merchandise, which is sold through Amazon. Right now, merchandise categories are primarily t-shirts, hoodies, sweatshirts “with other categories launching at a later date,” according to the Merch Collab website. Amazon owns the copyright for all designs created through the Merch Collab program. However, brands can request to purchase the copyright of a design for a fee designated by Amazon of between $5,000 and $100,000. Of the total royalty payment, two-thirds is paid to the brand and one-third to the designer. Presumably, this new licensing platform is building on the ongoing success of Merch by Amazon, which allows designers to upload their designs and select products (such as t-shirts) to sell—but requires designers to secure permission on their own for any third-party IP they want to use. With Merch Collab, Amazon is taking the step of providing designers with that permission to used branded content. And while while designers are giving up a percentage of royalty fees to brands under the Merch Collab program, the assumption is that branded merchandise has a higher sales potential to make up for that. Porter Anderson contributed to this report.